Los Angeles, California. 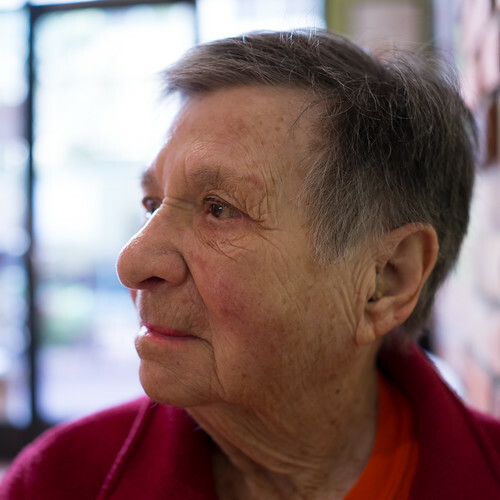 Having lunch with my 97 year old mother the other day and figured it might be a good time for a quick portrait with the rented Sony RX1. Here’s an example of where a fixed 35mm lens can be a problem. I’m trying to get the camera close enough to her so her face fills the frame and had I been using a viewfinder (EVF or otherwise) I’d have knocked over my coffee. So, the LCD was fine here but it was tough to see at a distance so I was unsure of where the camera was focusing. The only solution here would have been a longer (fast) lens. All in all I very much enjoyed using this camera although the potentially better portraits I took of her in lower light at dinner were failures because the AF never locked on. The AF on the Sony RX100 was locking in better than the RX1 at dinner. The RX1 is exactly the kind of camera I want though: very high quality, full frame, small enough to fit in a small shoulder bag, fast high quality lens. Had I taken the ice shots I took recently with the RX1 I think they’d have been out of this world and all of that extra resolution would have made better prints. Oh, and the silent leaf shutter on the RX1 was pleasing to my mother who can’t hear much anymore anyway but doesn’t like to hear me clicking away taking pictures. Sony got a lot right with this camera.